The YATE server is not processing an incoming INVITE without SDP properly. In this case the 200 OK towards the IMS should have a SDP offer. 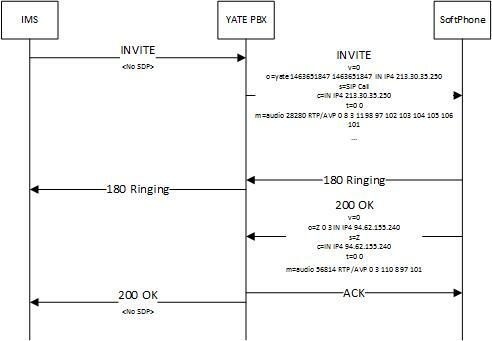 However, YATE PBX is "rebounding" the 200 OK from the SoftPhone with an ACK and replying to the initial INVITE with a 200 without SDP, which is not correct. Is there anyway of overcoming this scenario only through YATE configuration? For instance, simply forward the SDP between end points. Marian, ths for the tip. I've managed to forward the SDP's, but only for calls starting with an INVITE with SDP.